Samsung Electronics Co. Ltd. took to the stage at the Consumer Electronics Show (CES) in Las Vegas earlier this week to unveil its latest tablet: the Samsung Galaxy TabPro S, a 12-inch convertible tablet that runs Windows 10, and its high-end specs look like it could put serious pressure on Microsoft and its Surface Pro 4. Which products you prefer? 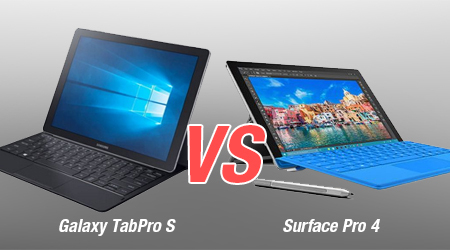 Let us look at the following Galaxy TabPro S vs Surface Pro 4 comparison. Samsung's Windows 10 tablet measures 11.5 inches x 7.8 inches x 0.24 inches, and weighs just 1.5 pounds. The Surface Pro 4, already a very slim and light device, measures 11.5 inches x 7.93 inches x 0.33 inches and weighs 1.73 pounds. Yes, the Galaxy TabPro S is slimmer and lighter than the Surface Pro 4. The Galaxy TabPro S features a bright 12-inch Super AMOLED display with 2,160 x 1,440 resolution. Samsung claims that the tablet is the first Windows device with a Super AMOLED display, which is a feature that has been present in Galaxy smartphones and tablets over the past few years. In comparison, the Surface Pro 4 has a 12.3-inch PixelSense display with a slightly higher resolution of 2,736 x 1,824. The Galaxy TabPro S will be powered by a sixth-generation Intel Core M3-6Y30 processor, which is dual-core and clocks in at 2.2 GHz. The tablet packs 4 GB of RAM, and will give customers the option of either 128 GB or 256 GB SSD storage. The Surface Pro 4, on the other hand, comes in three options of sixth-generation Intel Core processors, with customers able to choose between M3, i5 or i7. The tablet comes with a RAM of either 4 GB, 8 GB or 16 GB, and SSD storage options of either 128 GB, 256 GB, 512 GB or 1 TB. The Galaxy TabPro S is powered by a 5,200 mAh battery that promises 10.5 hours of usage, with the battery able to be charged up in 2.5 hours through the tablet's USB Type-C port. In comparison, the Surface Pro 4 is capable of 9 hours of usage. The cameras of the Galaxy TabPro S are a 5MP front-facing camera and a 5MP rear-facing camera with autofocus. The cameras of the Surface Pro 4, meanwhile, are a 5MP front-facing camera and an 8MP rear-facing camera, also with autofocus. Customers that would purchase the Galaxy TabPro S will also receive a keyboard case that connects to the tablet through its magnetic rear. The inclusion of the keyboard cover is a plus for Samsung, as the keyboard for the Surface Pro 4 is sold separately. The Galaxy TabPro S will be available in February, though the price of the tablet has not yet been announced. The Surface Pro 4 is currently available on the market, with the cheapest option at 128 GB of internal storage with an Intel Core M3 processor and 4 GB of RAM selling for $899. The most expensive option of 256 GB in internal storage with an Intel Core i7 processor with 16 GB of RAM carries a price tag of $1,799. It would be difficult to judge which between Samsung's Galaxy TabPro S and Microsoft's Surface Pro 4 is a better buy with the price of the former still unannounced, but in terms of specifications, the Surface Pro 4 is a more powerful device with more options for the user. The Galaxy TabPro S has some advantages though, primarily the inclusion of a keyboard cover as an accessory upon purchase of the tablet, its Super AMOLED display and its slimmer and lighter body compared to the Surface Pro 4. Anyhow it is another choice for Windows 10 tablet! For me, Galaxy TabPro S with a relatively small screen may be the right one to take on travel since it is easier to carry. But when it comes to the screen resolution, Galaxy TabPro S lags far behind Surface Pro 4. No matter which side gets your vote in the fight of Galaxy TabPro S vs Surface Pro 4, learning how to watch movies to Galaxy TabPro S/Surface Pro 4 doesn't hurt but benefits you. Dozens of great movies are released in 2015-2016. Do you want to play the Blu-ray, DVD and HD/4K movies on Galaxy TabPro S or Surface Pro 4 anytime and anywhere? iFastime Video Converter Ultimate can do you a big favor to rip regular and copy-protected Blu-rays/DVDs and convert HD/4K MKV, MOV, MP4 or standard AVI, MPEG, WMV, RM and VOB videos to Galaxy TabPro S/Surface Pro 4 supported formats. All-in-one movie converter to finish video conversion in fast speed and high quality for later flexible playback. Convert All Video Audio Formats: convert any movies to various video and audio formats on Windows (10). 200+ Preset Profiles for Apple and Android Devices: convert video file to portable devices like iPhone 6s (Plus), iPad Air 2, iPad Mini 4, Galaxy Note 5, Apple TV 4, etc. Move files from computer to Nabi/Hudl/InnoTab/LeapFrog/Kindle, etc. What Kind of Video/Audio Format can Play on Kids Tablets?